A notable difference between Adam Worth and the fictional crime lord is that Worth avoided violence. He regarded carrying, much less using, fire arms a sign of incompetence. But he did not hesitate to lie, cheat and steal his way to the heights of society, starting with faking his own death during the American Civil war. Macintyre is exhaustive in his documentation despite having few sources. Worth was uncooperative that way. Repetitive at time, Macintyre propels the reader through Worth’s amazing life and times. Late Victorian England anticipated current America. Perhaps the most startling thread is the master criminal’s relationship with William Pinkerton, the world famous detective. The latter chased the former across several continents and ended by performing an extraordinary service for the then old, dying reprobate. In the late nineteenth century international justice cooperation was just beginning. (Odd that not extradition existed between the US and UK.) A nimble crook could stay one step ahead of the law. Worth literally cruised the world looking for opportunities to separate the rich from the burden of their wealth. No Robin Hood, Worth did take care of his own people (even when they didn’t take care of him) and his friends and family. 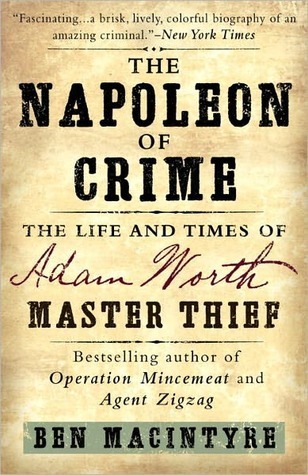 Macintyre follows Worth through the stealing and wasting of several fortunes, detailing his relationship with both real and bogus upper crust, not to mention some of the most daring crimes of the century. This entry was posted in Book, book review, Reviews, Ron Andrea and tagged biography, famous Gainsborough theft, greatest theft no one ever heard of, William Pinkerton's adversary and friend by andreart2013. Bookmark the permalink.